When Lord Krishna delivered the Bhagavad Gita to Arjuna, He was living in a time when adharma (unrighteousness) had been on the rise. Demons like Kamsa had been wreaking havoc, and royal dynasties like the Kuru lineage had been corrupted by immoral inheritors. Hence, Sri Krishna vanquished the demons and guided the Pandavas to victory in the glorious Mahabharat War. Nowadays, we are also living in a time that is saturated with adharma. The inner demons within people manifest themselves in acts of violence, cruelty, and other negative actions. 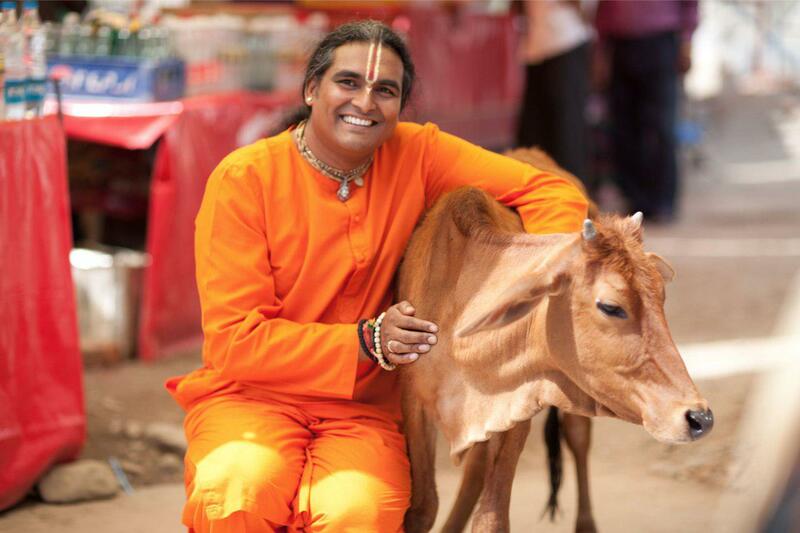 One of the issues that Paramahamsa Vishwananda constantly voices out against is the brutality towards animals. 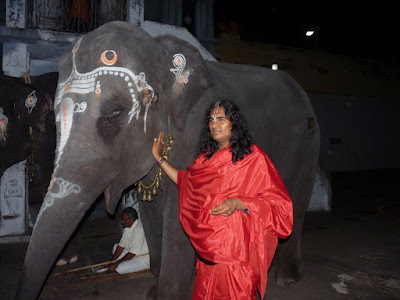 For those who follow Swamiji on twitter, you have seen the reality of how animals are treated when they are raised solely for human consumption. The state of this industry is shocking to say the least. Recently during Gurupurnima, Paramahamsa Vishwananda shortly addressed this topic and had one request for the devotees present which can extend to all devotees and people worldwide. 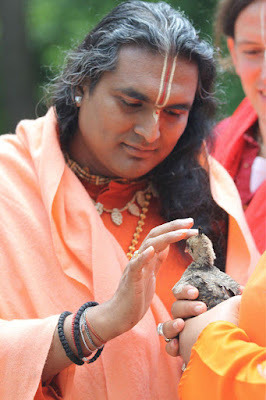 SV: Jai Gurudev everyone! If I ask you one thing, would you give it to me? The ‘one thing’ I would like from you is that you spread vegetarianism; spread the message that people should not kill animals. Do you promise me that? SV: For the satisfaction of their own tongue, human beings are supporting the brutality towards animals. It’s really miserable to see. If you want peace, firstly we have to change the mind, right? And to change the mind is not an easy thing, but we can make it easy by controlling the senses. Like Bhagavan Krishna says in the Gita, if you want to control the mind, you start by controlling the senses. So start putting sattvic food inside of yourself and encourage people to become vegetarian. Like that, this change will be reflected upon the mind. What you put inside of you, it also reacts very deeply on the mind. So, much of the brutality in this world is also due to what we consume. Whereas, people who are vegetarian don’t have such aggressiveness inside of them. They are more serene and calm. Here you can see clearly how one can change the state of mind, and how one can change the way one thinks, for a better world, for a world with peace and love. Therefore, whoever is not vegetarian yet, please become a vegetarian. I guess all of you are, true?! SV: Good. Now, you have made a promise to me, right? SV: I hope I don’t need to come after you and poke you. Well, Mother Nature will do that work for me. It’s better if you do it by yourself, because if She does it, She has Her own ways. Maya Devi is very powerful. All of you know about that, eh? So don’t let Her come after you. Due to this promise you have just made to me, change! You will see that all goodness will come to you. 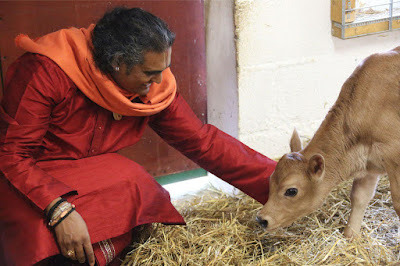 The blessing of Mother Nature will flow to you and, together with that, the Grace and blessing of Giridhariji, because He is the great protector of animals. Many times, the Lord has taken the form of an animal, isn’t it? Tonight we have seen Devi Rani, Bhavani and Shen presenting a dance performance about the manifestations of Maha Vishnu: Matsya, Kurma, Varaha, and Narasimha. They were all animals. Your body is a temple where the Lord Himself resides with all His splendour and all His love. So let’s remind everybody of this sacredness and keep the body healthy. So that’s the ‘one thing’ I ask you. That’s it. Nothing else. Estimates of the water required to produce a kilo of beef vary, from 13,000 liters 2 up to 100,000 liters.3 Whichever figure you use, the damage is plain when you consider that the water required to produce a kilo of wheat is somewhere between 1,000-2,000 litres. 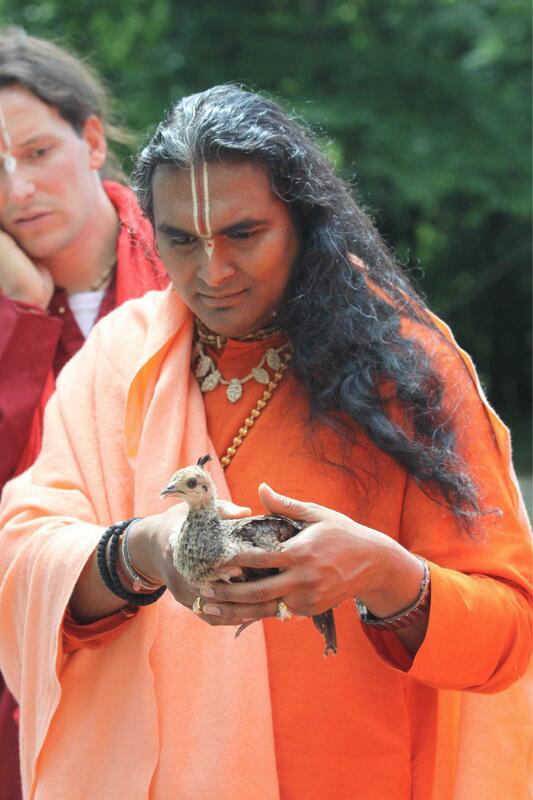 May all the devotees of Paramahamsa Sri Swami Vishwananda spread vegetarianism and veganism to help uplift the Earth and its people. Jai Gurudev! 3. Pimental, D., Houser, J., Preiss, E., White, O., Fang, O., Mesnick, L., Barsky, T., Tariche, J.S. and Alpert, S. 1997. Water Resources: Agriculture, the Environment, and Society. Bioscience. 47 (2), 97-106. 5.Thorogood M, Mann J, Appleby P, McPherson K. Risk of death from cancer and ischaemic heart disease in meat and non-meat eaters. Br Med J. 1994;308:1667-1670. 6. Chang-Claude J, Frentzel-Beyme R, Eilber U. Mortality patterns of German vegetarians after 11 years of follow-up. Epidemiology. 1992;3:395-401. 7. Chang-Claude J, Frentzel-Beyme R. Dietary and lifestyle determinants of mortality among German vegetarians. Int J Epidemiol. 1993;22:228-236.